The holidays are a wonderful time of year to travel home and visit family members or friends. Approximately 30% of Americans traveled home for the holidays last year—or 94.5 million people traveled 50 miles or more, according to the American Automobile Association (AAA). I wonder how many people will travel home this year? Travel during the holidays can be the worst, especially by plane. The airports are crowded with people, and if you’re like me, you may experience nausea from the turbulent weather. Aside from the delays and cancelations, what affects the most flyers at this time of year is very likely jet lag. The coast-to-coast trips across time zones can be exhausting. It also interrupts the body’s internal time clock, which leads to holiday jet lag. As a result, it becomes difficult to get a good night’s sleep. Jet lag can also produce symptoms such as headaches, mild depression, appetite loss, confusion, irritability, digestive problems, muscle soreness, and poor concentration. The body makes the hormone melatonin to help regulate your sleep cycle. When you travel across time zones, I recommend you supplement with melatonin a half hour before bedtime to help reduce jet lag symptoms, including daytime drowsiness. It is best to take melatonin three days before a flight when traveling east, and also four days after you arrive at your destination, especially when you travel in the dark. In a systematic review published in 2012, nine of 10 trials found that melatonin is considerably effective for the reduction or prevention of jet lag. The researchers suggested that daily doses of melatonin (between a half a milligram and five milligrams) are effective, especially when multiple time zones are crossed. Melatonin is recommended when jet lag has been experienced during previous travel. People with epilepsy or those who take the blood thinner warfarin are also advised to speak with their doctor before using melatonin. There are many homeopathic remedies that help relieve the symptoms of jet lag; however, the best remedy for you also depends on your other symptoms. Gelsemium may be recommended when other signs also include exhaustion, excess thinking, fevers, or the flu, or if the person is also a smoker. Long hours of inactivity can produce circulatory problems, such as swollen legs and feet, and Arnica montana can help promote the healing of tissues and dead cells in the body. Chamomilla is another good remedy to relieve sleeplessness, drowsiness, anxiety, disorientation, and stress related to jet lag. Rhodiola rosea is a popular adaptogenic herb that can improve sleep quality; regulate stress, fatigue, and adrenal gland function; and boost your immunity and overall mood. When you are planning to travel by plane, 300–400 milligrams daily of Rhodiola rosea is recommended at least a few weeks before and a week after your flight. It may also be best to aid stress and support the use of adaptogenic herbs with important nutrients like vitamin C, vitamin B complex, zinc, and magnesium. What Are Other Natural Jet Lag Remedies? It is also best to avoid alcohol or caffeine. These stimulants can make your holiday jet lag worse. Clean, filtered water is also known to prevent dehydration, and jet lag symptoms. Psyllium husk is known to prevent constipation from flying-related dehydration. Other helpful supplements also include valerian root, passion flower, kava kava, or 5-hydroxytryptophan (5-HTP). Exercise before your holiday flight will also relieve stress, which can help you sleep on the plane. Herxheimer, A., et al., “Melatonin for the prevention and treatment of jet lag,” Cochrane Database of Systematic Reviews 2002; (2): CD001520. Hershoff, A., Homeopathic Remedies: A Quick and Easy Guide to Common Disorders and Their Homeopathic Treatments (New York: Penguin Putnam Inc., 1999), 200–201. Balch, J., et al., Prescription for Natural Cures: A Self-Care Guide for Treating Health Problems with Natural Remedies Including Diet, Nutrition, Supplements, and Other Holistic Methods (Hoboken: John Wiley & Sons, 2004), 368–369. Wright, C., “Avoid nuisance of jet lag with these top natural remedies,” Natural News web site, February 21, 2013; http://www.naturalnews.com/039185_jet_lag_natural_remedies_nuisance.html. “Homeopathy for Jet Lag,” altMD web site; http://www.altmd.com/Articles/Homeopathy-for-Jet-Lag, last accessed December 20, 2014. Terrass, S., “Nutrition and Herbal Medicine to Survive Long-Haul Flights,” PositiveHealthOnline web site, December 1999; http://www.positivehealth.com/article/nutrition/nutrition-and-herbal-medicine-to-survive-long-haul-flights. 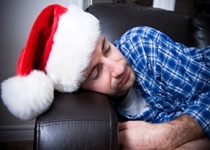 “Jet Lag and Melatonin,” WebMD web site; http://www.webmd.com/a-to-z-guides/jet-lag-and-melatonin-topic-overview, last accessed December 20, 2014. Hall, J., “AAA: More Than 46 Million Americans to Celebrate Thanksgiving with a Holiday Getaway, Most Since 2007,” AAA NewsRoom web site, November 20, 2014; http://newsroom.aaa.com/tag/thanksgiving-travel-forecast/. Levs, J., “A mile-long line and 3,000 flights canceled or delayed as travel woes strike,” CNN Travel web site, December 1, 2014; http://www.cnn.com/2014/11/30/travel/thanksgiving-travel-home/. “What is jet lag? What causes jet lag? How do you prevent jet lag?” Medical News Today web site; http://www.medicalnewstoday.com/articles/165339.php, last updated September 26, 2014.